I’m a bit of a nut for cases, and I get ridiculously giddy about the different ways I can play dress up with my iPhone. Wait, did I say dress up? I meant armour my iPhone and defend it from the evils of rough surfaces and unplanned trips to the floor (that sounds manlier, right?). The 4VOi Lorem has been one such piece of armour, and I think it’s a novel approach to the all-too-generic plastic hard case. 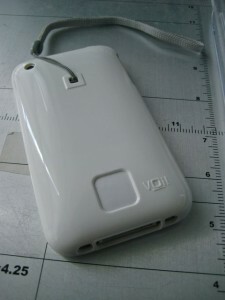 The Lorem is a two-piece shell with a lanyard attached to the back. Unlike most two-piece cases, however, this one is made up of a front and back plate. You simply drop your phone into the back piece and snap the front Axent ring into place to seal the deal. The case closes very tightly, but there’s lots of room to comfortably insert your iPhone without worrying about dust or plastic scratching the device. 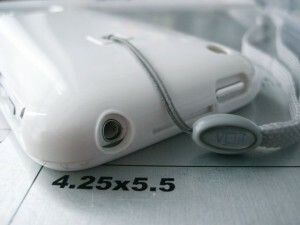 I found the design very elegant, which is surprising to me, since most plastic cases tend to look rather cheap. Aside from acting as a lock for the case, the Axent ring is also meant to be an easily interchangeable accessory to match what you’re wearing. The Lorem currently comes in four different colours, and so you can put a white axent on black, or pink axent on red, etc. You’ll have to buy two cases to mix and match the colours, but it’s good to know the option is there. Based on the website, 4VOi might be adding more colours at a later date, but the black and white cases make the safest combos for now. The Axent just clicks into place when you put it on, but it takes more than a quick tug to pull it off. You’ll actually need to take a coin (I used a quarter), roll it into the groove along the top of the case, and then twist it to loosen the ring. I definitely suggest rolling the coin in all the way to the left, though, as I accidentally marked up my case by twisting the coin while it was in the wider part of the groove. There isn’t too much to say here, but it is worth mentioning that the 4VOi logo on the back of the Lorem is actually a functional part of the case. When you’ve removed the Axent ring from the front, all it takes is a simple push on the logo along the back to lift the iPhone gently up and out of the case. The logo is actually just a soft plastic of some sort that’s attached to the fabric lining inside, but it feels hard when the phone is installed because it’s right up against it. I know that we usually like to purchase things with no strings attached, but I think lanyards are the exception. The Lorem features a simple lanyard that’s not quite long enough to be a wrist strap, but is a great way to fish the iPhone out of your pocket or add a little extra peace of mind while using the device. If you’ve got a longer one lying around, you can actually replace the lanyard that comes with the Lorem, but I found it a suitable length after using the case for a week or two. It does take a little getting used to, though, as you’ll have to lay your iPhone down on tables in a very particular fashion to make sure the string doesn’t stay underneath it. This bugged me at first, since I want my device to lie flat when I put it down, but I’d rather have the slight annoyance of pushing the string aside than do without having an extra security and accessibility feature on the case. Did I mention I really like lanyards? The cases I received for review also came with the optional matted screen protectors, and I love them! They do add a bit of graininess to the screen, but they’ve really significantly reduced the glare on my iPhone, and I really like the different texture of the matted finish. It’s a different (smoother) feeling from something like the InvisibleShield, and it’s also much easier to install since it’s actually a solid plate that you simply place on the screen. While I’m not really sure how the Lorem will handle a full-on drop, it does do a great job of protecting the device in the everyday. The iPhone’s screen is actually in a small depression thanks to the raised Axent ring, so it’s shielded from direct impact, while remaining accessible enough for easy typing in portrait or landscape mode. All of the buttons, switches, and ports are in similar depressions, and you can tell that 4VOi really took the time to design every opening. The areas around the power button and the silent switch are extra wide, for example, so that you can actually access them without having long fingernails. I’m really grateful to 4VOi for sending these two Lorem cases over to have a look at, and I think they’re a great deal at $25.00 (seeing as $35 seems to be the average price for good plastic cases). The Lorem’s design is curvaceous and simple, and the lanyard and Axent ring make it stand out from the crowd. 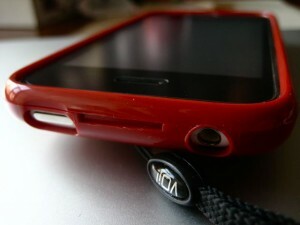 These features are more than just cosmetics, and they’re what make the Lorem one of my favourite iPhone cases to date. 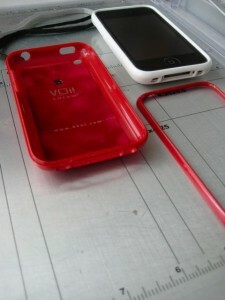 The 4VOi Lorem is available in four colours from 4VOi.com. Each case costs $25, but you can add the optional matte screen protector for $6 more. The cases are only available in the US at the moment, but I’m hoping they’ll be available in other lands soon enough. Thanks to reader Shobizz for the heads-up on these cool cases! I like lanyards too. And it may be time for me to start putting my iPhone in a case. Thanks for the review. how's the thickness compared to incase slider? thinner? as thin? errr scratch that. Made a replyp earlier, but just went to incase's website. I'd say they're about the same thickness.